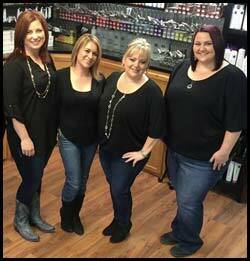 Cuts N Such Hair Salon is a Paul Mitchell Focus Salon located in Denham Springs, LA. Salon owners, Holly and Shay, met in 2003 at a baseball game for their children and they became fast friends. With their boys hanging out together all the time, they would spend most of their time discussing how to open a salon together. When they finally decided to do it, Cuts N Such Hair Salon opened their doors on March 7th, 2006. We offer a variety of services for the whole family! We strive to provide our guests with a laid back, comfortable environment. Come visit us by reserving your spot today!